This article is about the dish. For the genus of beetles, see Humba (beetle). Humba is derived from the Chinese red braised pork belly (hóngshāoròu, also called hong ma or hong ba) introduced to the Philippines via Hokkien immigrants, but it differs significantly from the original dish in that Filipino humba has evolved to be cooked closer to Philippine adobo, using a lot more vinegar. Humba also does not traditionally use rice wine, ginger, chilis, or five-spice powder; and it commonly use additional ingredients like banana flowers or pineapples, which are absent in the original dish. Regardless, traces of its Chinese origin is still evident in the primary use of fermented black beans (tausi), an uncommon ingredient in Filipino cuisine. Humba is sometimes inaccurately referred to as the "Visayan version of adobo", largely because of how humba became cooked closer to adobo over time. But they have different origins and refer to different dishes. Humba is a specific dish usually restricted to pork belly, while adobo is a cooking process that can be used to cook a variety of ingredients from meat to vegetables. In the central and southern islands of the Philippines, both humba and adobo exist and are not confused with each other. The defining ingredient of humba is the fermented black beans (tausi), without which it is basically just a slightly sweeter Philippine adobo. Like adobo it has many different variants, but it is relatively easy to prepare albeit time-consuming. The most basic humba recipe uses fatty cuts of pork, usually the pork belly (liempo). It is marinated in a mixture of soy sauce, vinegar, garlic, bay leaves, and black peppercorns. The pork is then sautéed with the garlic. Once the meat is half-cooked and lightly browned, water is added with the rest of the ingredients along with fermented black beans and muscovado sugar (or some other sweetening agent). Banana blossoms may also be added. It is then allowed to simmer for a few hours until the meat is very tender. Alternatively, it can be cooked in a pressure cooker to cut down the cooking time. Hard-boiled eggs may be added before serving. It is eaten with white rice. Humba can sometimes be prepared with chicken, in which case it is more or less identical to Philippine chicken adobo, except for the use of tausi. It can also be prepared with pineapples as the sweetener, which again makes it very similar to another Filipino dish, the hamonado. A similar dish to humba is pata tim, which is also derived from hóngshāoròu. But pata tim does not use vinegar or tausi and primarily use pork hock with péchay and mushrooms. 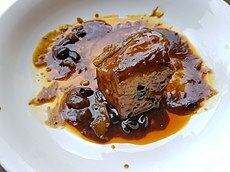 ^ "Recipe: Humba (Hong Ma or Chinese Soy Sauce Braised Pork)". The Big Fat White Guy. Retrieved 9 January 2019. ^ "Pork Humba Bisaya (Braised Pork Belly)". Russian Filipino Kitchen. Retrieved 9 January 2019. ^ "Humba: Pork Stewed in Vinegar, Garlic, Soy Sauce and Sugar". filipino-food-recipes.com. Retrieved 9 January 2019. ^ "13 Unique Dishes That Will Put Filipino Cuisine Back on the Map". Spot.ph. Retrieved 13 January 2019. ^ a b "Humba". Kawaling Pinoy. Retrieved 9 January 2019. ^ a b Agbanlog, Liza. "Humba (Filipino Braised Pork with Black Beans)". Salu Salo Recipes. Retrieved 9 January 2019. ^ a b "How to cook Humba with Sprite – Filipino Style Red Braised Pork Belly". Pursuit of a Functional Home. Retrieved 9 January 2019. ^ a b "Homba". Lutong Bisaya. Retrieved 9 January 2019. ^ Sarthou, Myke. "Chicken Humba Recipe". Yummy.ph. Retrieved 9 January 2019. ^ "Homba". Lifestyle.com.au. Retrieved 9 January 2019. ^ "Pata Tim (Braised Pork Hocks)". Panlasang Pinoy Meaty Recipes. Retrieved 10 January 2019.